It was a big surprise, when the Fields Medal awards were declared. A woman was among the winners. The surprise was not that a woman had won the award but the fact that, she was the first women to have won the awards from its inception. After almost 80 years, a woman has won the math’s world’s “Nobel prize” for the first time. Maryam Mirzakhani of Stanford University, California, received the Fields medal at the International Congress of Mathematicians in Seoul, South Korea. Established in 1936, the medal is presented by the International Mathematical Union in recognition of truly outstanding work undertaken before the age of forty. Up to four medalists are chosen once every four years – a total of 56 medals have been handed out so far. Winning the Fields Medal is something akin to winning a string of Olympic golds, or being Wimbledon champion several years in a row. It takes that level of brilliance, that level of total dedication and determination. You need, of course, to be born gifted; you need to have your talent recognized and nurtured. Then you need to get yourself a top-class education and to train with people at the very top of their field; and finally, you need to apply your brilliance and knowledge with courage and immense perseverance. Maryam Mirzakhani, who is Iranian, studies the geometry of moduli space, a complex geometric and algebraic entity that might be described as a universe in which every point is itself a universe. Mirzakhani described the number of ways a beam of light can travel a closed loop in a two-dimensional universe. To answer the question, it turns out, you cannot just stay in your “home” universe – you have to understand how to navigate the entire multiverse. 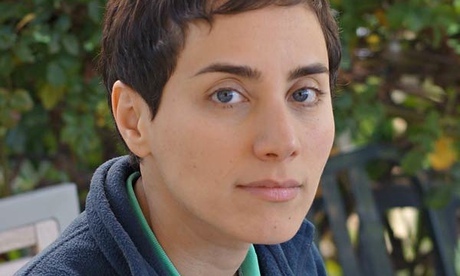 Mirzakhani has shown mathematicians new ways to navigate these spaces. The award committee cited her work in understanding the symmetry of curved surfaces. Her research topics include Teichmüller theory, hyperbolic geometry, ergodic theory, and symplectic geometry. Mirzakhani was born in 1977 in Tehran, Iran. She went to high school in Tehran at Farzanegan, National Organization for Development of Exceptional Talents (NODET). She competed and was recognized internationally for her math skills, receiving gold medals at both the 1994 International Mathematical Olympiad (Hong Kong) and the 1995 International Mathematical Olympiad (Toronto), where she was the first Iranian student to finish with a perfect score. She obtained her BSc in mathematics (1999) from Sharif University of Technology in Tehran. She went to the United States for graduate work, earning a PhD from Harvard University (2004), where she worked under the supervision of the Fields Medalist Curtis McMullen. She was also a 2004 research fellow of the Clay Mathematics Institute and a professor at Princeton University. As a child growing up in Tehran, Mirzakhani had no intention of becoming a mathematician. Her chief goal was simply to read every book she could find. She also watched television biographies of famous women such as Marie Curie and Helen Keller, and later read “Lust for Life,” a novel about Vincent van Gogh. These stories instilled in her an undefined ambition to do something great with her life; become a writer, perhaps. She became both the first woman and the first Iranian honored with the Fields Medal, the most prestigious award in mathematics. Born with an exceptional gift for mathematics, her talents have been nurtured and allowed to flourish, her teachers have recognized and fostered her genius, and her male colleagues have not questioned her ability in a subject where raw brain power is what brings the most respect. The tectonic plates have shifted, and female mathematicians have finally come of age. Marayam Mirzakhani is a diva, a role model for women of the Muslim world. A world where religious fundamentalism is destroying the real essence of Islam. She further reinstate the contribution of Muslim scholars to the world, after the glorious days of scientific Islam. Inspirational indeed. Let us hope and pray her work in opening up the Universe of Possibility does not fall afoul the fundamentalists, as happened to another great female mathamatician, Hypatia, who was assasinated by ignorant Christian bigots.